Give your truck some extra HP, TQ and MPG with this gibson F150 split rear cat back exhaust!!! The Gibson Split Rear Exhaust System is specially engineered to each and every model to make sure each system is a perfect fit. It comes in either aluminized steel or stainless steel, both come with a T-304 stainless steel tip that will last a lifetime. The Split Rear Exhaust adds a racing look to your F-150 while giving you that famous Gibson rumble. This Cat Back will set your truck apart from all the other boring sweep side exhaust systems out there. This System is guaranteed to give your F-150 up to 15 - 20 horsepower while still adding as much as 2 - 3 MPG. This Cat Back is specially designed to create the perfect amount of back pressure to guarantee that every time you hit the gas you will be pushed back into your seat. 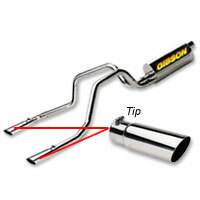 With today's market flooded with trucks this Gibson Split Rear Exhaust System is a must have for you 2009 F-150.